You will find below the synthesis and presentation made by Ana María López-Sobaler, from the Department of Nutrition and Food Science of the Faculty of Pharmacy of Complutense University of Madrid, Spain. The majority of children fall short when it comes to eating enough whole fruits, vegetables and whole grains. Breakfast provides a great opportunity to squeeze in more healthy foods and boost overall nutrient intake. 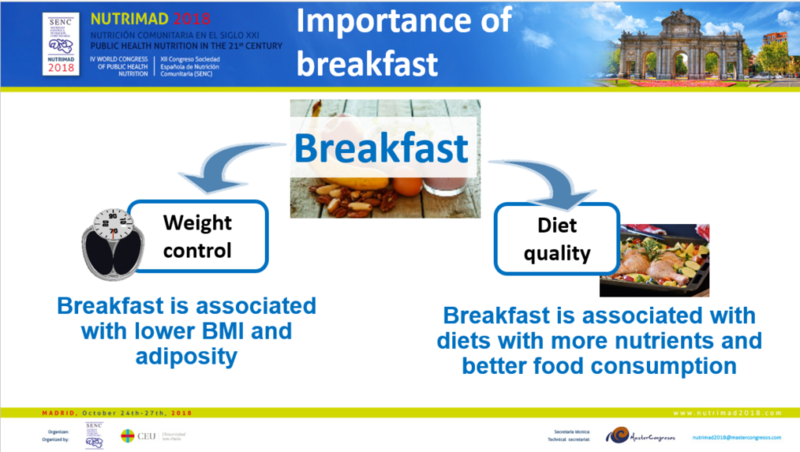 Prof. López-Sobaler highlighted studies which show that eating breakfast is a key factor in both weight management and improved diet quality in children. For example, Prof. López-Sobaler discussed the ALADINO study, which included 10,899 Spanish children ages 6 to 9. Results from ALADINO showed that routinely skipping breakfast was linked to a higher Body Mass Index and a higher percentage of children presenting with obesity. Breakfast Quality: Better with Yogurt in the Mix? 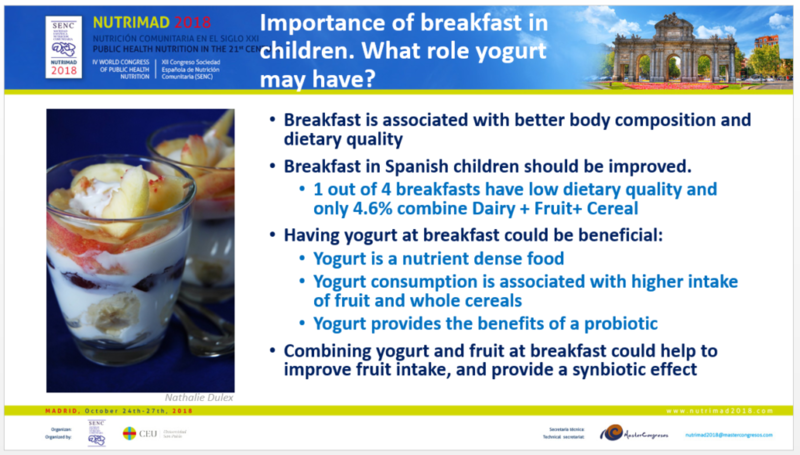 Including yogurt as part of breakfast provides a number of advantages, according to Prof. López-Sobaler. A complete breakfast should ideally contribute between 20-25% of the daily energy needs, and include dairy, whole grains and fruit on the menu. Prof. López-Sobaler studied Spanish children ages 6 months to 17 years of age in the ENALIA study (National Dietary Survey on the Child and Adolescent Population). She found that 1 out of 4 breakfasts have low dietary quality and only 4.6% combine dairy, fruit and cereal grains. 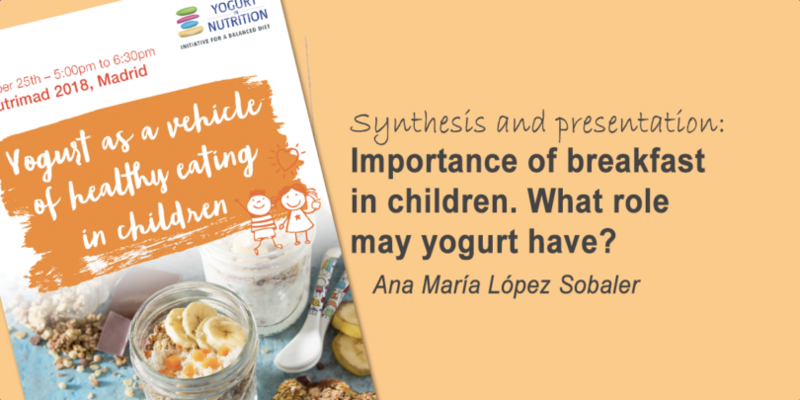 A high percentage of the schoolchildren and adolescents had an insufficient intake of key nutrients such as calcium, folate or vitamin D. She suggested that the inclusion of yogurt could make a difference in improving the diets of Spanish children. Yogurt contributes a number of important nutrients, including protein, calcium, phosphorus, magnesium, zinc, selenium, potassium and several B vitamins. Frequent yogurt consumption is also associated with a higher intake of fruit and whole grains. When yogurt is combined with whole grains and fruit, children will also consume more fiber, vitamin C, vitamin A, potassium and other key nutrients. In addition to the rich array of nutrients contained in yogurt, the live bacteria in yogurt provide benefits that extend beyond nutrition. The live strains of lactobacillus and bifidobacteria contained in yogurt are a rich source of probiotics. Many recent studies have underlined the association between a greater microbial diversity and better health conditions (lower inflammation, lower risk of types 2 diabetes and obesity). When fruit is added to yogurt, there is a synbiotic effect from the fiber (specifically fructo-oligosaccharides), phenolic compounds, vitamin C, antioxidants, and carotenoids contained in the fruit. Putting yogurt and fruit together creates enhanced survival of probiotics inside the gastrointestinal tract. Together, the prebiotic nutrients in fruit and the probiotic live cultures contained in yogurt create a synbiotic effect which strengthens the body’s microbiome, extending important digestive, immune system, and overall health benefits. Yogurt is a food of high nutritional density. Children who eat breakfast consume diets with more nutrients and also have a more favorable body composition compared to children who skip the morning meal. Studies from both Europe and the United States show that many of the breakfast meals eaten by children have a low dietary quality. Since yogurt consumption is associated with higher intake of fruit and whole grains, it is a logical vehicle to improve both breakfast and the overall nutrient quality of children’s diets. AECOSAN (Spanish Agency for Consumer Affairs, Food Safety and Nutrition). Ministry of Health, Social Services and Equality. Estudio ALADINO 2015: Estudio de vigilancia del crecimiento, alimentación, actividad física, desarrollo infantil y obesidad en España 2015. Madrid, 2016. López-Sobaler AM et al. Adequacy of Usual Vitamin and Mineral Intake in Spanish Children and Adolescents: ENALIA Study. Nutrients. 2017 Feb 13;9(2). Ramsay SA et al. Skipping breakfast is associated with lower diet quality in young US children. Eur J Clin 2018 Apr;72(4):548-556.